Near the shores of Loch Leven, close to the road up towards Glencoe rises a small island out of the cold tidal waters. On a sunny day in summer the lush grass smells of herbs, the rough song of the crickets creates a somehow Italian atmosphere. No bridge or ferry connects the island full of graves with the world of the living. You need a boat, your own or a chartered one to access it. Various Highland clans bury their dead here, the Stewarts of Ballachulish, the Camerons of Callart and the MacDonalds of Glencoe, to name but a few. 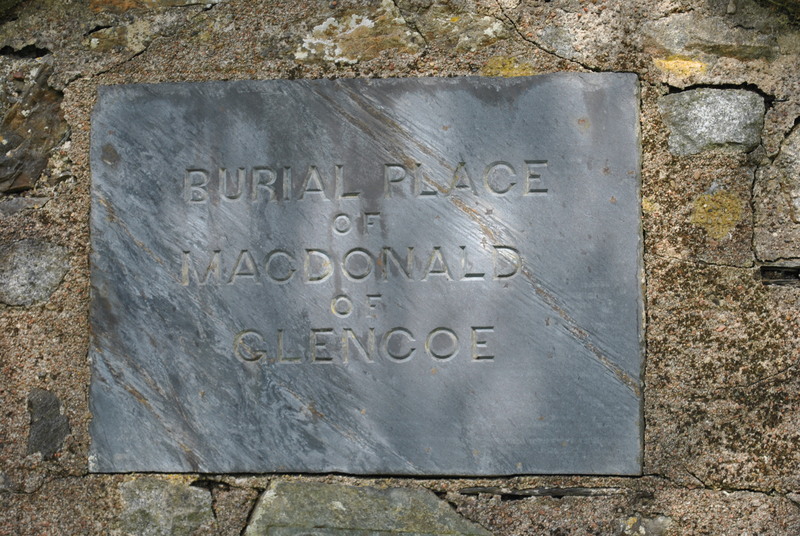 A small plate denotes the grave of a legendary chief of the MacDonald clan: Alastair MacIain, 12th Chief of Glencoe who had travelled though the wilderness of Glencoe to Fort William to swear fealty to the King. The governor there refused to take the oath and sent the old chief through the winterstorms to Inverary to make his oath there. With a letter stating he had been in time but in the wrong place. MacDonald believed he was safe. But the Campells persuaded the King to order the MacDonald’s death. 120 men under the command of Robert Campbell of Glenlyon took shelter in Glencoe as guests of the MacDonalds’. Alastair MacIain was killed in his bed, 38 of his men were murdered, 40 women and children fled an died of exposure in the cold winter nights of Glencoe. Alastair MacIain is remembered on Eilean Munde and so are many of his clan. It is quite exhausting to wander around this lonely place. The grass is high and there are virtually no footpaths. Overgrown and broken stone slabs threaten to give way under the intruder’s feet. Could one fall into an old grave by accident? A horrible thought you somehow can’t get rid of. 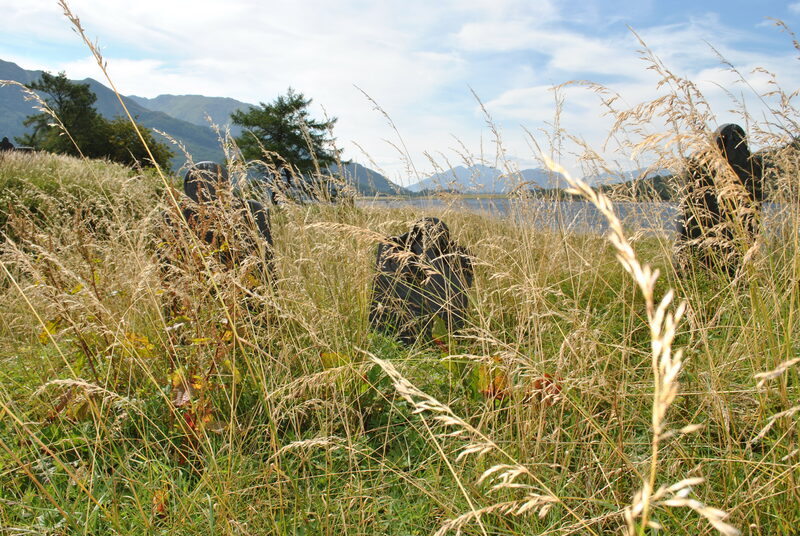 Most headstones come frome the nearby Ballachulish quarry. Slate with ornate writing. A rather unusual material for highland burial grounds. But very beautiful set against the summer grass. The site of the massacre is nearby, still legendary in memory, literature and song. Even though it was more than 320 years ago. An old tale about the betrayal of trust, about death and life in the Highlands of Scotland. Eilean Munde is all that and more. Many a piper will have played a sad lament, when a boat took a new body to the island of the graves. A beautiful and final place to rest. 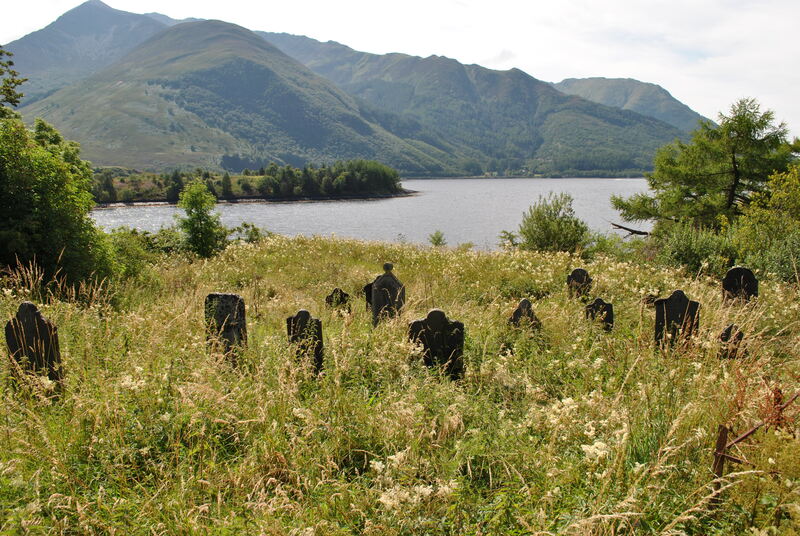 The Glencoe Heritage Trust have published a copywrite book of all the graves on the Island. It owns a half-share (Pro-Indiviso) of the island. 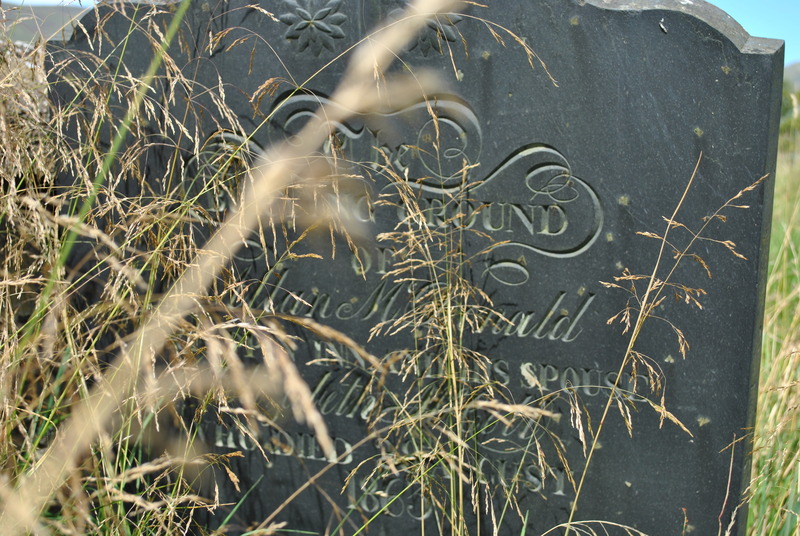 There are no burials allowed on the island now, as there is a lack of topsoil, the last burial took place in 1972, of Mrs Christina MacDonald Sharpe. A native of Glencoe. Scottish Natural Heritage advise that Eilean Munde should not be strimmed of grass, but left in it’s natural state. However when some Clanspeople wish to visit, the Trust ensures that pathways are cleared as much as possible. One does not require permission to visit. What an amazing place! Thanks so much for writing about it. I wish I could visit. 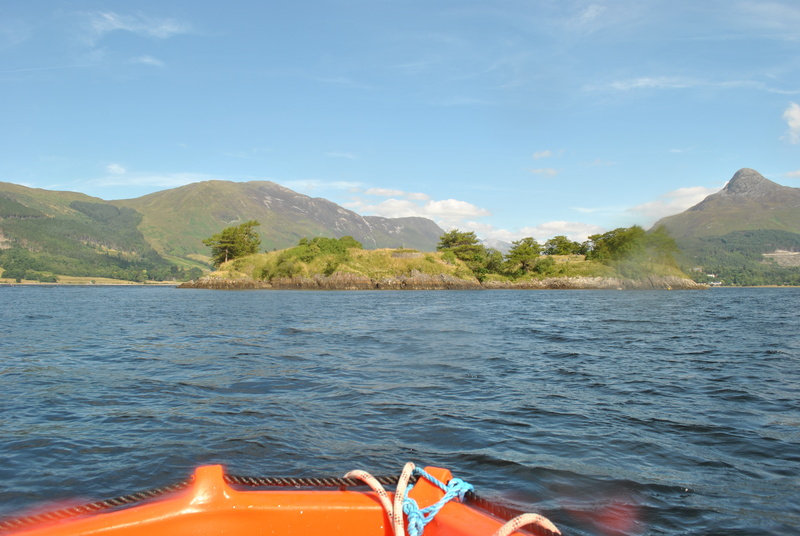 Kayaked on to this island from Invercoe. Very inquisitive seals acting like guardians around it’s shores. Hauntingly tranquil and beautiful. Oh, lucky you! We never saw any when we were there. My father was buried on Eilean Munde in 1951. This is the local version of the Massacre of Glencoe. It should be respected. “Aig ghaoil Dia,” thuirst i, “fàg an gille agam,” thuirst i.
Ach bha cat ann. Agas mharabh e an cat agas chuir e fuil a’ chait air a’ chlaidheamh. ’N uair a thill e air ais son dearaadh a thoirst do’n chommandair gun do mharabh e e, sheall e an claidheamh dha làn fuil (K512.1.). Dh’ fhàg seo làn-riaraichte an commandair. Ach ’n uair a dh’ innis e gur e shàbhail a bheatha agas ’s ann a ghabh e bàidh glé mhór ris. Agas chum e riamh tuillidh m’an taigh-òsta e a’ dèanadh mar a thoilicheadh e fhéin gus na chaochail e (Q40.). But there was a cat and he killed it and he smeared the blood of the cat on his sword. When he returned to prove to his commander that he had killed the infant boy, she showed his sword smeared with blood (K512.1.). This fully satisfied the commander. When he told him that it was he who had saved his life became greatly beholden to him and so he was given lodgings in the inn and could do what he liked until he passed away (Q40.). Glencoe is the most famous glen in the Highlands and it is so not only because of its scenery, which is wild and magnificent, but because of its grim history and the memory of a night of dark treachery and bloodshed in February 1692. The Massacre of Glencoe goes down to history as a blot on the name of Campbell and not so much blame is attached to the monarch who signed the order to extirpate the luckless MacDonalds. William of Orange was no doubt fully aware of what he was doing when he signed and counter-signed the order to murder old MacDonald and his clan in cold blood, even though the fact that MacDonald had taken the oath of allegiance was concealed from him. The massacre was rather the result of deliberate, planned official policy rather than the outcome of a blood-feud between the Campbells and MacDonalds of Glencoe. The real and unfortunate truth was that the Campbells were no more than tools used by unscrupulous authorities to overawe the Jacobite Highlands. The name of Campbell has been eternally disgraced by the events of that dark February night, not so much because the victims were dispatched without warning but because the time-honoured code of hospitality was outraged. Despite all that, it will surprise many to know that even to this very day in such districts as Keppoch and Moidart, both in the heart of the MacDonald country, popular tradition exonerates the Campbells. In Moidart the story was told that on the night preceding the massacre a Campbell soldier went to visit one of the MacDonald houses. He had been to that same home on several evenings previously, and, as they sat round the fire on the fated night, a greyhound lay sleeping in front of the fire. For a few moments all conversation stopped and the Campbell soldier spoke to the sleeping dog: “O grey hound, if you knew what I know, your bed would be on the heather this night!” No sooner had the visitor gone than the family made for the hills and escaped. Another story had it that a Campbell soldier told the terrible secret to a grey stone. Many of the MacDonalds did escape on the night of the massacre. Thank you very much for this detailed and valuable contribution to the post, it is much appreciated, especially since you have a very personal connection with Eilean Munde. Your father rests in a special and beautiful place. Nice article and a great place. Permission to land on the island should be sought from the Glencoe Heritage Trust who manage it. Just one other (wee) thing- you dinnae get cicadas in Scotland! I must have felt so Italian that I though I heard what wasn’t there. Thanks for pointing out the mistake. The trust owns half the island as far as I know but I have contacted them to make sure. That is a very nice article and photos of Eileen Munde. I am told that there were Henderson’s (aka MacEanruig) in the MacDonald group, one being the bodyguard and piper for the chief. Did you find any knowledge of Henderson’s or MacEanruig’s in your research? Or a grave headstone? I am a Clan Henderson Society of America member. Several gravestones were uncovered by grass-cutters on the burial island two weeks ago. One belonged to a local Henderson family and had been hidden for about a century-and-a-half. I shall record the details when I next return in the Spring. Thank you for this valuable contribution Ewan. That sounds very interesting. Please share when you have more details! I enjoyed reading this page of your blog. The images and history depicting Eilean Munde create a timeless story about human relationships and loss. By chance would you know the name of the lovely wildflowers on the island? In particular, the flowers in the first image surrounding the tombstones? Thank you. Hi Susan, glad you enjoyed my blog but I am afraid I can be no help as far as the wildflowers are concerned. They are very common in the Highlands but I do not know their name. Sorry! I sent an enquiry to Plantlife Scotland about the wildflowers and received a reply. The lovely flowers are Meadowsweet Filipendula ulmaria. The 1972 burial related to my grandmother, Christina MacDonald Sharpe. In 1991 I took my mother’s (her daughter) ashes over and scattered them over that family grave. This is a very special place; I hope my daughters will place my ashes there in time. How beautiful a tradition among the women of your family. Very special indeed. Thank you for sharing this Cristina! This place seems so right. I have been tracing my McIntyre family tree. My great-grandfather x3 was John (of Culloden) McIntyre but 1717. He died 1792 and buried at Eileen Munda. Also, enclosed in the grave is his spouse Isobell(Anny) Campbell, son Robert & wife Christina, son John(of Brecklet) & spouse Clementina McNab. I feel a great sense of belonging when learning about my Scottish ancestors. Finding this site and seeing a picture of where they rest raises more questions. Is there a headstone? Can I find out more about great-grandmothers Clementina McNab & Anny Campbell? Who were the parents of John (of Culloden) McIntyre.? Scottish history, to me, is the best. So proud to be part of it.